Maximum tuition fees at universities in Wales will rise in line with inflation to £9,295 from autumn 2018, Welsh ministers have announced. The fees will continue to be linked to inflation for the next three years. Top fees at England's universities have already risen to £9,250 and are likely to be over £9,500 by autumn 2018. Welsh Education Secretary Kirsty Williams said the rise was due to England's policy but student leaders condemned the increase. Ms Williams told AMs Welsh higher education "operates in a UK-wide and international context". "We are leading the way with our shift to support living costs, but policy in England also has a direct knock-on effect," she said. "Our universities must be able to compete domestically and internationally - jobs, prosperity and national well-being depend on it. "I can confirm that they will continue to be paid for through a publicly supported loan system and only repaid after graduation, linked to income levels." Image caption Kirsty Williams said Wales needed a "stable and sustainable higher education sector"
But National Union of Students Wales president Ellen Jones said her announcement "makes the mission of getting students into higher education harder - not easier". "Let me be very clear: we do not support any rise in fees," she said. "We understand that budgets are under pressure as a result of the UK Government's regressive approach to public spending but where the axe falls is up to the Welsh Government. "I cannot stand the fact that students are being used to shoulder this particular burden." Ms Jones said she wanted Welsh ministers to "protect the entire education budget just like it has the health budget, instead of making the sector fight over what money there is". Plaid Cymru education spokesman Llyr Gruffydd said it was "hugely disappointing" that ministers were "increasing the burden of debt on students". "Students generally pay higher levels of interest than most people pay on their mortgages, so it's no surprise that around 75% of students never pay back their debts," he said. Conservative AM Darren Millar called the fee rise a "betrayal of students across Wales and a kick in the teeth to Labour voters across the country". "Just weeks ago, Labour's first minister was telling people to vote Labour to scrap tuition fees, yet today, with amazing hypocrisy, his Government has announced a hike in the cap on tuition fees paid by Welsh students," he said. 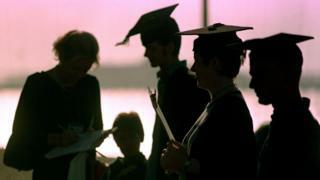 The Welsh Government also confirmed it will implement a new system of financial support for students. Following last year's Diamond Review, all students from 2018-19 will get £1,000 a year before being considered for a means-tested grant to help with living costs. Ministers estimate a third of full-time students will receive the maximum grant of £8,100 for a student living away from home. A student coming from a household with an income of £25,000 will receive a grant of around £7,000 a year. Good riddance to tuition fee grants?